Grand master fantasy artist Frank Frazetta's most famous work is Death Dealer. 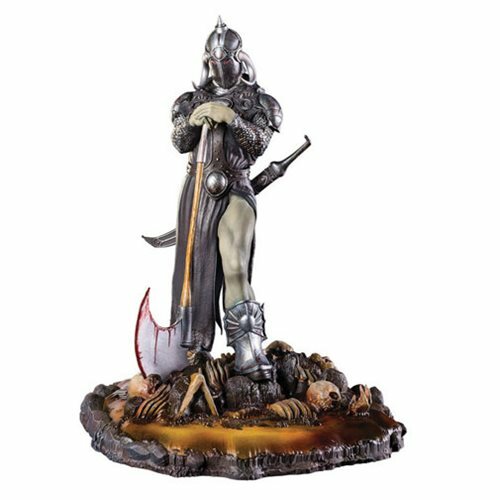 He painted several versions of this brooding warrior, and Dark Horse have translated the third of these into a detailed Frazetta's Death Dealer 3 Statue that captures the mood and colors of the painting. Standing 10-inches tall on a base strewn with the remains of vanquished foes, this piece joins our previous Death Dealer sculpture in a growing Frazetta legacy collection. Limited edition, hand-numbered statue with certificate of authenticity. Ages 15 and up.